A HEART FOR GOD: Am I really content? I tend to think of myself as not a covetous person. After all, I don’t crave fancy cars, high end jewelry, or a huge mansion. I certainly don’t need the latest gadgets, the newest computer, or designer jeans. I think of the strawberry and raspberry plants that I managed to kill, and I wishI knew how to garden. My four year old daughter tells me that she’d like to make a little yellow jacket for the baby, with little canary yellow buttons sewn on, and I wish I was a knitter, a seamstress, or both. I visit friends’ homes that are beautifully well kept, with a place for everything, and everything in its place, and I wish that clutter wasn’t a constant battle for me. I wish it would come to me as easily as it seems to come to them. I think of women I know whose husbands have home businesses, and I wish we could spend that much time together as a family. I wish the zoning board would allow us to keep chickens. I wish I weren’t allergic to cats. I wish I weren’t such an untrained housewife, having to learn so much of this as I go, reinventing the wheel along the way, and wondering if I’ll even be able to learn how to keep order, and garden, and knit, and sew, in time to teach my daughter. Not exactly the conventional definition of coveting, but coveting nonetheless. 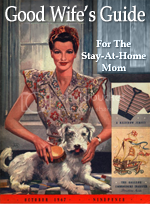 I recently read a piece written by a woman, describing all the amazing things her mother did as a homemaker while she was growing up. The list was designed to show just how happy and productive a woman’s life inside the home can be, but it put me to shame and brought me to tears. How can I possibly be a good wife and mother if I can’t can vegetables, keep a beautiful flower garden, sew dresses for my daughter, and teach my children how to play piano, all the while keeping the house company-ready, just inviting opportunities for drop-of-the-hat hospitality? I’m not good enough. How can I ever be good enough? Comparing my weaknesses to the strengths of others, while neglecting to be grateful for the gifts and abilities God has given to me, is coveting at its lowest, and truly smacks of idolatry. While I’m pretty sure there isn’t a spiritual gift of house-cleaning–and if there is, I certainly don’t have it–I think the same principle can be applied. God did not create me to be the clone of Martha Stewart, June Cleaver, or anybody else for that matter. He made me, with all my weaknesses and shortcomings, to honor and glorify Him. Grace. Ah, yes…it all comes back to grace. How could I be more blessed than to be an object of His grace? Father, forgive me. Boast about my weaknesses? I confess that I don’t think I’m there yet. I’m not even sure what that would look like. I read these verses, and words like “distresses”…”persecutions”…and a lump forms in my throat. 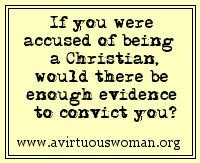 When have I ever experienced real distress or true persecution? Content…for Christ’s sake…am I?…could I really be? Wow!...that was great and to the point. Never thought of things the way she put it. I do know that when I hear of other mothers doing things a certain way I have thought...boy I wish that was me. Never thought of it as coveting. Susan, that was excellent. Thank you! I also went over to your other blog and am right with you! I tried to comment, but it wouldn't work. Know you're in my prayers and sharing your journey!! Hello Sunny Susan, my friend! This is Deborah from Facebook, and Xanga ... aka: threads_of_faith! I wanted to thank you for coming by my Xanga, and let you know that I have a site here on Blogger, too, oh, and I tweet! Lol!! You can see the link on my site here, if you want to follow each other! I'm going to follow you here, on Blogger. Now, there'll be lots of ways to stay in touch! Lol! This was a great post! I really needed to read it today ... wow, how easy it is to tend towards coveting! I do tend to wish I could be as good as other photographers out there, and as good a gardener as my friend ... well, I'm going to look at this differently, now ... we need to appreciate the gifts God has given to each one of us individually! Thanks so much for sharing it! I just saw a quote the other day, along these lines ... Just be yourself, everyone else is taken! So true, now, if we can just get a hold of that! !